Shoshin keeps practice fresh and vital. After over 30 years of practice, I still find magic in basic aikido principles. In turn, my students’ joy in discovering the power and beauty of aikido heightens my sense of wonder. Sometimes, I step out of my comfort zone and test my ability to sustain the open spirit of shoshin. Recently, for example, I had this experience. “I told you how to sharpen your pencil the first day of class!” the teacher scolds. We are two or three days into a weeklong timber frame class and I have no idea what day of the month it is. “No pressure to stay late,” Skip, the head instructor assured us. “This should be fun!” But we all feel the heat. If we want to complete the timber frame cabin in the allotted week, we need to increase our pace. Given my snail-like progress with chisel and plane, I feel obligated to spend extra time on the job. So we go to work, wood against steel. But something is wrong. To provide a strange example: the wooden beams seem to grow larger as the week progresses. I stand ankle deep in a pile of white pine chips while hacking away at something called a tie beam, which is supposed to be 12’ 10” exactly, on the dot, but somehow everything I measure is off by 1/8 of an inch (a gross understatement, but in this age of “alternative facts” I want to preserve an inkling of pride)! Every time I draw a line, I swear that my pencil mark moves mysteriously to the left or right. 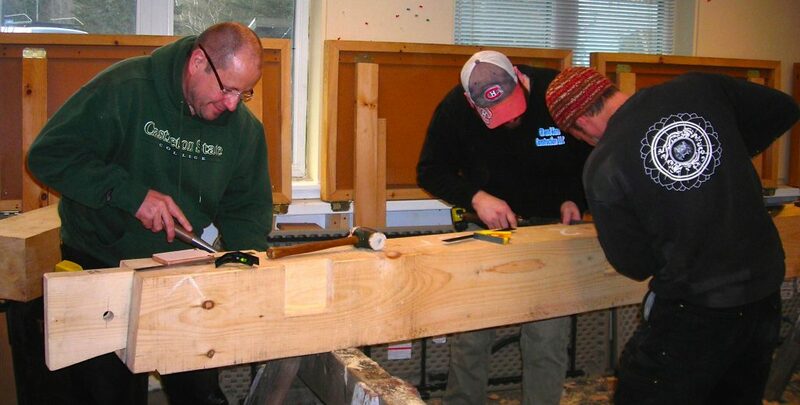 We stare at my fuzzy approximation of a pencil line, which has none of the sharp, Euclidian perfection of Skip and Seth, my timber frame instructors. Completing the infamous tie beam. Author wears the watch cap – he is working with a father and son (Josh is the guy in the baseball hat). Skip demonstrates how to properly sharpen a pencil with a chisel and scribe a line with the carpenter’s square. Just shy of 48 years, I have a sudden flashback: I am 10 years old, and my father helps me with a basic math problem. I can’t grasp the simple mathematical equation. I have that familiar, dull feeling of incomprehension: fractured by fractions, reduced by subtraction. In short, I feel really stupid. While Skip sharpens my pencil, I take a deep breath. This isn’t working. Instead of taking pleasure in learning, I want to demonstrate my aptitude for woodworking. I compare myself to Josh, who works quietly nearby. He has completed his dovetails in a fraction of time; I am sure that last night he slept the sound sleep of a sawyer while I dreamed of damaged dovetails and the gaping mouths of mortises. With a shock of humility, I am reminded that this desire for easy competence is the reason why many students quit aikido. In this age of instant gratification, we hope to quickly attain mastery. In the popular movie The Matrix, the hero downloads combat skills via electrodes on the head. As if it was so simple! * Ironically, in the age of computer-stimulated attention deficit, this obsession with speed makes it more difficult for students to value old methods of learning skills through constant physical repetition, repeating patterns until they are internalized. Interestingly, students with prior martial experience often struggle the most with aikido. In our desire for perfection, we forget the joy of being a beginner. I consider my options. I could quit class and drive home; I could choose a hobby that would help me relax, maybe hatha yoga, meditation, or even the martial arts. It might take a while, but after many years of training, I might discover the key to unbroken awareness. Hey, what about aikido? Those folk promise miracles! Self-deprecating humor makes me laugh. I realize that I need to let go of useless conceptions of perfection and cultivate a spirit of joyful inquiry. I stop comparing myself to the other students. And why should I worry what the teacher thinks? I am a beginner! As if preparing for combat, I relax my shoulders and center myself. Instead of thinking, I focus on how I feel. I inhale the clarifying scent of pine, and feel how the sharp chisel cuts soft pine without effort, leaving a magically shiny surface. How do we discover Shoshin? Receptivity cannot be taught in the manner of math. But it can be nurtured and cultivated, like a pine seedling reaching for the sky. When large trees fall in the woods, they create openings – empty places – in which growth occurs. If we cultivate this spirit of emptiness, our joy in learning overcomes the limitations of ego. Most importantly, by focusing on learning through movement and feeling instead of thought, we discover a whole new method to assimilate knowledge. The timber frame class reminds me of the challenges faced by new aikido students. It is good to remind beginners that our desire for perfection impedes learning. I hope to cultivate an atmosphere of joyful inquiry in which curiosity overrides the ego. Joy reflects the spirit of boundless emptiness in which there is no negative judgment. In aikido, there is no enemy; instead, the attacker is a force, a manifestation of energy. Rather than fighting back in fear and anger, we discover how to blend with this energy. Likewise, this pine beam is no longer an opposing force; as I carve, the form of the dovetail reveals itself in all of its simple beauty. I discover the visceral excitement of learning something fresh and vital. Once again, like a student stepping into the aikido dojo for the first time, I experience the state of flow that is the gift of shoshin. Bent number three is completed. 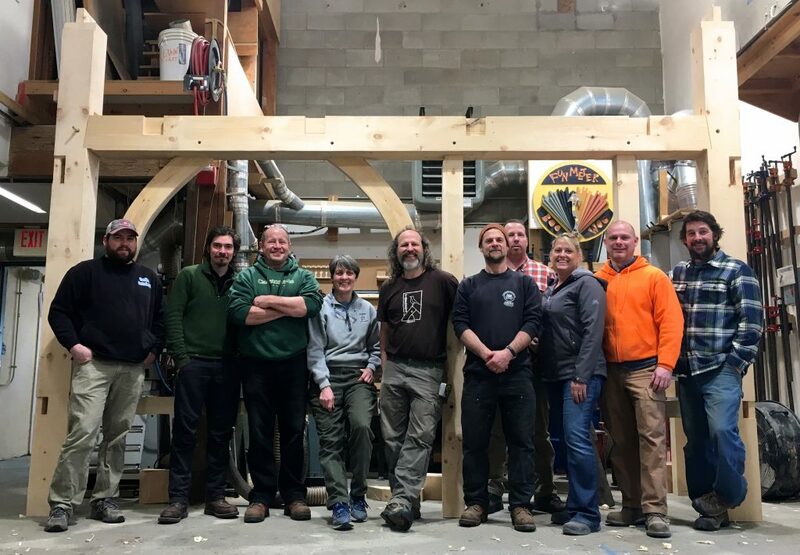 A photo of the timber frame class and instructors at Yestermorrow Design School. Class instructors were Skip Dewhirst (with long hair and beard in the center of photograph and Seth Kelley, far right). Author is dressed in black, 5th from right. Benjamin Pincus is the Chief Instructor of Cloud Mountain Aikido in Roxbury, Vermont and Chief Instructor and Executive Director of Aikido of Champlain Valley. 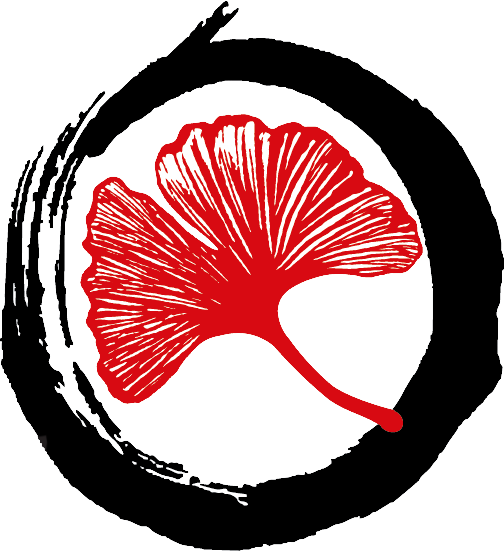 Located in Burlington, Vermont, Aikido of Champlain Valley is a 501c3 non-profit dedicated to creating a sustainable community and peaceable world through the study of the traditional Japanese martial art of Aikido. Sensei, nice article, it captures the heart of shoshin. I particularly like the phrase “fractured by fractions, reduced by subtraction.” I am constantly fractured and reduced and yet life goes on, like the sand, wind, and stars.